In a world that straddles the border of fantasy and magical realism, people are graced with a Talent (yes, that is with a capital T) that determines their fate in life. Cady is a young orphan girl who has an amazing Talent for cake baking. In an attempt to find Cady's forever family, Miss Mallory, the proprietress of Miss Mallory's Home for Lost Girls, and whose own Talent involves finding the perfect family for all her girls, sends Cady off to live with Toby, a man who works and lives above the Lost Luggage Emporium, to see if they're a perfect fit. As Cady gets to know Toby along with all the other residents that live above the Lost Luggage Emporium, it slowly becomes clear that something ties everyone together, even the devious owner of the emporium who has an obsession with finding powder blue suitcases. The untangling of the knots in this story is what kept me turning the pages. It's definitely a book that you can pick up and before you know it you're already halfway done with it. 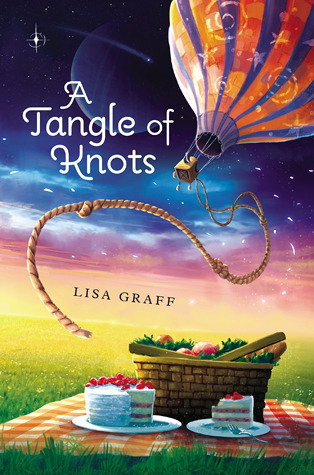 After reading many other reviews of A Tangle of Knots, what initially sold me on it was the backstory of the main character Cady and her Talent at cake baking. I thought this would make for quite the delectable read, but I found that not much was done with that in terms of the descriptions of the cakes she bakes. There are places in the story where her cake recipes are strategically placed and I liked Graff's idea of having Cady know just the perfect cake for every person she bakes for, but other than reading the recipes placed throughout the story, I didn't really get a good handle on Cady's Talent. With the exception of a couple instances, I didn't quite understand why everyone's perfect cake was perfect for them. Not to mention the fact that I didn't quite hear the vernacular and language of a baker in Cady's Talent. There were a lot of "didn't quite" moments throughout reading this book. However, what did quite work for me was what I saw in Cady, which was a kind, tender-hearted child who was easy to root for. Due to all the dropping of clues and the "knots" readers must untangle to unfurl the plot, when I first started reading this book I was immediately put in mind of When You Reach Me by Rebecca Stead, though I have to say that I think Stead was much more successful at giving her readers that "Aha!" moment when all those puzzle pieces finally came together. I'm still scratching my head about a few puzzle pieces that I felt didn't quite fit together, which made the ending feel unresolved but I suppose in the end, it really was. It just didn't feel that way. Still, I enjoyed reading it a great deal and would highly recommend A Tangle of Knots to any readers who like mysteries or are trying to ease their way into fantasy. As someone who is not always a fan of fantasy, I can say I appreciated the fact that the world and setting would have been realistic (Poughkeepsie New York is about as un-fantastical as it gets*) had it not been for the small difference of everyone's Talent with a capital T.
Cover Comments: This book probably wins the most beautiful cover award for books published in 2013, and while it's beautiful to look at on a computer screen, it's even more gorgeous in person as it has an iridescent shimmer to it. If the cover doesn't get kids to pick this book up, I don't know what will, so please Philomel, please do not change the cover in a year when the paperback comes out. Keep it just as it is. *That comment was not meant as a slam on Poughkeepsie BTW, so you if interpreted it as such, that was not my intention. I would say that about my own city if it were the setting of this novel, and I love my hometown. The weirdest thing draws me to this book. The word "emporium", it's such an unusual word and immediately reminds me of one of my favorite movies, Mr. Magorium's Wonder Emporium. I wonder if this book has the same whimsical qualities. That cover is gorgeous and I like novels with recipes in them. It's always a surprising treat to find them. This sounds like such a fun read, even if not all the puzzles are solved satisfactorily. I really enjoyed this book. I loved the untangling of the mystery and the inclusion of the cake baking - I think there was just the right amount of food language for kids (if not for adults). "I took a bite, and then my brother. Crunch, crunch. It was more than good; it was delicious. Raw celery has a slight sparkle, a zingy taste that you don’t get in cooked celery." I guess that's the piece I was missing from this book: the feeling of being hungry for cake while I was reading. oh my gosh, i just realize that my grandmother's secret super power is baking cakes. She always baked the most wonderful tasting cakes. Fortunate for her, she lives in a retirement home that has baking as part of their programs for the residents. For the first time that i know of, she made us butter tarts last year.